All Souls of Sioux Falls was founded in 1886 by Eliza Tupper Wilkes, who worked to spread the Unitarian message through the prairie. The original All Souls Church building is pictured above. The building stood near the present Washington Pavilion in downtown Sioux Falls, where there is a historical marker at the location on the west side of the CineDome. Membership declined in the 1900s and the new building built by Eliza Tupper Wilkes’ congregation soon became the city library. No records exist of Unitarian Universalist activities until the second decade of the 1900s, when a group called Universalist Women was organized. In 1922 a Unitarian Club was formed with services conducted in homes, the municipal courtroom and other public buildings. Visiting ministers often came from Sioux City, Iowa, or more distant places. During the 1920s and ’30s, Unitarians met in small groups, usually in homes. Interest in the denomination waxed and waned but persisted. On February 7, 1951, the Unitarian Fellowship was granted a charter. 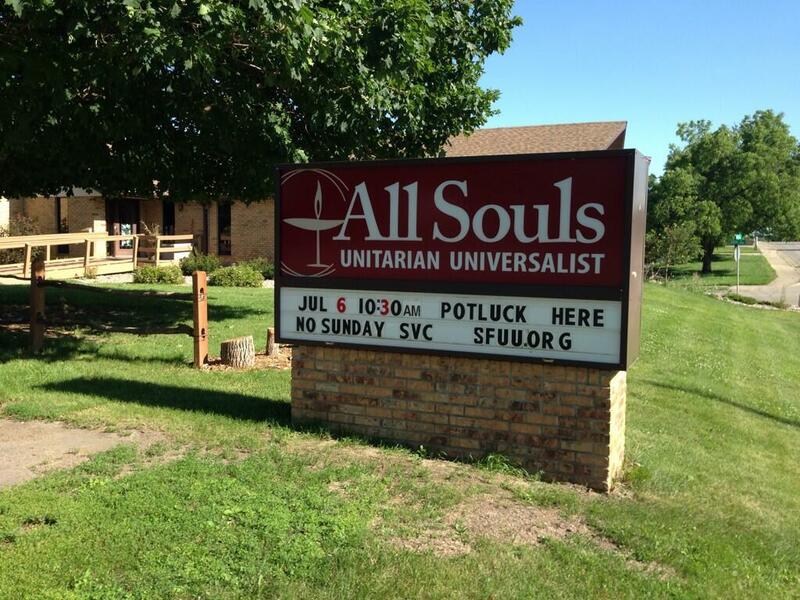 After the Unitarians and Universalists merged in 1961 to become the Unitarian Universalist Association, the UUA granted a charter to the Unitarian Universalist Fellowship of Sioux Falls on May 15, 1961. During the ’60s the Fellowship held meetings which featured lectures by members as well as by guests from other churches and often by faculty members of local colleges. These programs were followed by open discussion following services. All Souls maintained ties with the UUA and sent delegates to the national annual meeting, the General Assembly. Children in Religious Education (R.E.) classes numbered up to 25, but by the ’70s, membership dwindled as the youth grew up and families moved away. In the mid-’70s, an increase in membership revived the Fellowship and R.E. classes resumed. A more traditional order of service was introduced and various adult activities and workshops were instituted. By 1978, 100 years after Eliza Wilkes had begun her Unitarian ministry in Sioux Falls and the surrounding area, membership had grown to about 40. In the 1980s members of All Souls came to the conclusion that the congregational size needed for sustained stability as well as having credibility as a religious institution could be attained only if it had a building known to be its home. 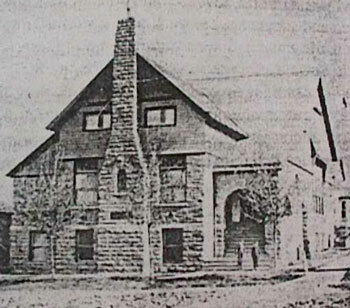 The church building would serve not only as a point of recognition in the community but would become a focus for the activities of the Fellowship and a symbol of the continuing life of Unitarian Universalism in Sioux Falls. The building was sold when it no longer met the needs of the congregation and was not accessible to all. 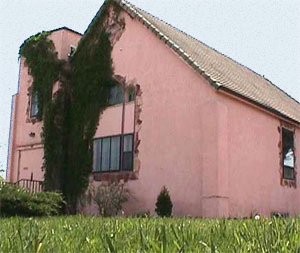 In 2009-2010 plans moved forward to purchase the Free Methodist Church at 2222 Cliff Avenue. It was in May 2011 that All Souls moved to that location and remains today (between 26th and 33rd Streets). The Fellowship had had no minister of its own from the turn-of-the-century until 1979-80, when Rev. Phreaner was hired and served as minister. The Rev. Jay Atkinson was an occasional visiting minister from Sioux City for three years thereafter. In 1986 the congregation decided that a distinctive and denominationally appropriate name would strengthen the Fellowship’s identity. Chosen from several names submitted by members it was decided to return to “All Souls Church,” the name of the first Unitarian church built in downtown Sioux Falls in 1887. For two years, 1986-87, the Rev. Laurie Bushbaum was a Prairie Star District Extension Minister for All Souls. Following Rev. Bushbaum, the Rev. Penny Binger, who followed Rev. Jay as minister to the Sioux City church, enlivened the Sioux Falls pulpit several times a year. Other clergy from within the Prairie Star District served the congregation from time to time, leading worship services and providing special guidance as needed. In 2010 Rev. Armida Alexander was called as All Souls Church’s half-time minister. She served until her retirement in 2014. David Kraemer served 2014-16. Minster Sarah Caine served as Interim Minister for All Souls from November 2016 – August 2017.